Earlier this year, Future burst onto the scene with YC on the hit single, “Racks.” Future was formally introduced to the game, however, when he released his “Tony Montana” track. Aside from the Watch the Throne tracks, “Tony Montana” has been the most-freestyled track of this year. The “Tony Montana” track received a major boost when Drake added a verse to the track, which became the official remix. Last week, Future discussed the video of “Tony Montana.” Upon contacting Drake, Future and his team agreed to make the Drake-featured “Tony Montana” the official single. When it was time to film the video, however, Drake was unavailable. When it was time to film the video, Future had to do it without Drake. Obviously upset with the way Drake’s team handled the situation, Future still gave him props for being a part of the “Tony Montana” track. While Future was a little disappointed with what happened with Drake, things have gone over much smoother with T.I. Fresh out of prison, T.I. is eager to re-gain the position he held in the rap game in 2009. When T.I. was searching for hot tracks, DJ Drama pointed him in the direction of Future’s “Magic” track. T.I. hopped on the track and Future made his verse a part of the official remix. 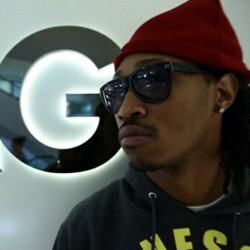 When discussing the “Racks” single, Future hinted that he was the one who wrote the song. He told the people to listen to the song and to tell him who it reminded him of.